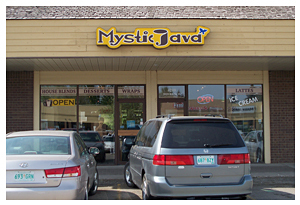 Mystic Java is your neighbourhood stop for fresh lunches, decadent desserts, over 100 types of tea, and of course... FABULOUS coffee. Enjoy a great selection of real-fruit smoothies & home-style milkshakes. Free wireless internet and live music every Friday night.